From time to time Breyer will have a special release through the Just About Horses (JAH) magazine. The 2005 Breyer JAH Special Edition model celebrated the 30th anniversary of the magazine. 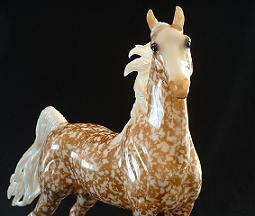 For this release, the American Saddlebred (ASB) mold was used to create four different and very collectible models. Each of these models has white mane and tail and a bald face with eye whites, natural color hooves and white stockings. and the Matte Wedgewood (solid Wedgewood Blue body color). Each of the models from this release is stamped on the underside with the words "JAH 30th Anniversary Special Edition". There was only 1000 of each of these made for this Special Edition and each one is truly a piece of art that is very collectible.